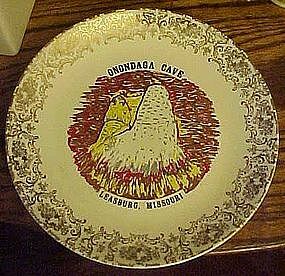 Vintage souvenir plate of Onondaga Cave, Leasburg MO. Vintage souvenir plate for the Onondaga cave in Leasburg, Missouri, 9 1/8" in diameter, coupe shape, decorated with metallic gold filigree border and the caves in the center. No chips or cracks. Gold is excellent. No makers mark.